I had to renew my driver´s license the other day. When I got to the Department of Motor Vehicles, it turned out that they had changed addresses, and only listed “Torre Saltillo” as their new address. I had no idea where Torre Saltillo was. Fortunately, I had a few ideas, and they turned out to be pretty good ones. So, to save others hours of aimless wandering, the new address for the License Office is on the north side of the Periferico Luis Echevarría Alvarez, between Torre Saltillo (a very tall building occupied by Banorte) and Starbucks–the Starbucks right next to Pour le France. It´s a much better location than the previous one by the jail. But, back to the original question–do you need a Coahuila driver´s license? Permanent residents officially have one year after being issued permanent residency to apply for a Mexican driver´s license. If one is not a permanent resident, one can´t get a Coahuila driver´s license. No worries– any valid foreign driver´s license is valid here, too. A driver´s license costs $599 pesos and is valid for 2 years. What do you need for a first-time Coahuila license? When I went, there was someone standing by the door, eager to direct all applicants to the right window. I brought my visa, but forgot to bring a copy of it. Fortunately, there was a house across the street that happily made a copy for a peso. After turning in the proof of payment, I sat in front of the camera, and recorded my digital thumbprint and digital signature. Five minutes later, the new license was hot off the press, and I was good to go! There is a parking lot in front of the License Office, but it looked like it was a paid lot, and the neighborhood doesn´t seem the least bit shady and doesn´t have heavy traffic, so the lot was empty while everyone parked on the street. And that´s the skinny on getting a Coahuila driver´s license! Back to School: in Mexico! All around the world, it´s that time of year. All of us who have school-aged children are battling the crowds, shopping for notebooks, pencils, and uniforms. School is school the world over, right? Yes it is. However, when I first came to Mexico, there were a few customs that threw me through a loop, and life would gone more smoothly with prior warning. Once kids are in elementary school, they have at least 5 notebooks and 5 textbooks (likely more) that all need to be covered. The notebooks need to be color-coded, according to subject, and then sealed with contact paper. The textbooks also need to be preserved for all time with the help of contact paper. On the bright side, I have heard that some papelerías offer book-covering services for $50 or less. That´s $50 well spent. They just need to advertise better on my side of town! Homework for kids in preschool and early elementary school often consists of bringing in magazine or newspaper cutouts. Bring in cutouts of musical instruments. Bring in 10 cutouts of people waving hello or goodbye. Bring in 10 words that start with the letter C.
Bring in 5 cutout triangles. Bring in 10 proper names. Apparently, there is no end of things kids can be asked to cut out. Now, if I were to let my 5-year-old use the scissors and look for all 10 of those letter Cs himself, we could easily spend hours and hours on kindergarten homework. To facilitate things, I have him look for one (and sometimes help point it out) and he cuts out the first one (to work those fine-motor skills, of course). Then I cut out a number of words, about a third of which start with C. Out of the words I cut out, I ask him to identify which ones start with C, so then he can pick them out and glue them in his notebook. And then he cuts words out here and there as he sees fit, as that boy loves scissors. In the end, the homework gets done in a timely manner, and the kid works both his brain and his fingers a bit. Win-win. In the list of school supplies that the teachers give out every year, there is always that odd addition: 4 rolls of toilet paper. The following week, we are then hit up to donate some bleach and mop soap. Maybe this is just a public school thing (but I doubt it). See, for public schools in Mexico, the government builds the building and pays the teachers. The parents are responsible for the rest–primarily, maintaining the school building. That donation that they ask for every year for the Parents´ Association? That money is very necessary, paying for the school´s telephone bill, ink for the printer, repairs that need to be made throughout the year, etc. So every couple of months, kids go to school, armed with a package of toilet paper. Hands-down, it´s one of the more essential school supplies. This doesn´t happen at my kids´ public schools, but I´ve heard that some private schools will write notes home, chastizing the parent if a child has very long fingernails. If they´re long enough to gather dirt, they´re at risk for the Fingernail Note! Once upon a time, I worked at a children´s home, taking care of elementary aged kids. Those kids were sent back home if their fingernails were too long! Watch out! A few years ago, it was mandated by the Secretary of Public Education that the last Friday of every month be set aside for teacher inservice days. So, all public school students (and I believe most private school students) have the last Friday of every month free. 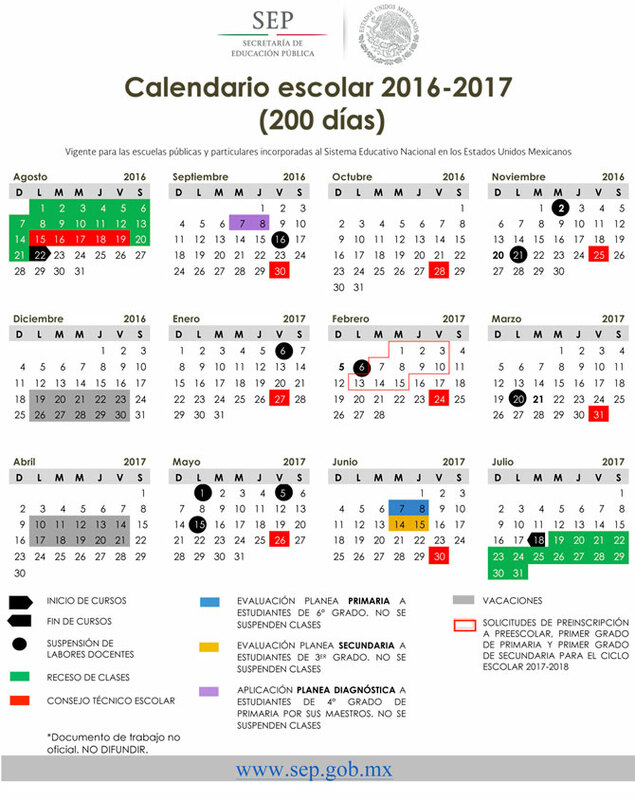 teacher, I had no set date when the last day of school would be, because it´s possible for private schools to be finished a week or two before the official last day of school set by the government. However, each school needs an official visit from the SEP by the end of the year, for them to determine if the students reached their academic goals (and could therefore be done for the year). Things get even trickier this year, because it appears that the SEP is giving schools the option of having a longer school day, and having a 185-day school year. Or schools can stick to their regular hours and use the 200-day calendar. So the last day of school is either June 27th OR July 18th–depending on your school. Since my son´s school day has been extended, but my daughter´s hasn´t, it seems one kid will start summer vacation in June and the other in mid-July. Awesome. But we´ve got 190 more days of school to get through first, so let´s enjoy them! Is there anything else with the Back-to-School season that throws you for a loop? Let me know in the comments section!